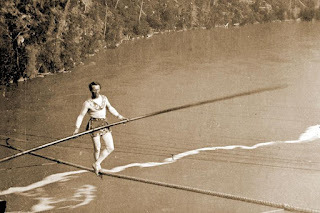 On September 15th, 1860, the great French acrobat Charles Blondin stood on a 3-inch thick tightrope stretched across the massive Niagra Falls gorge. 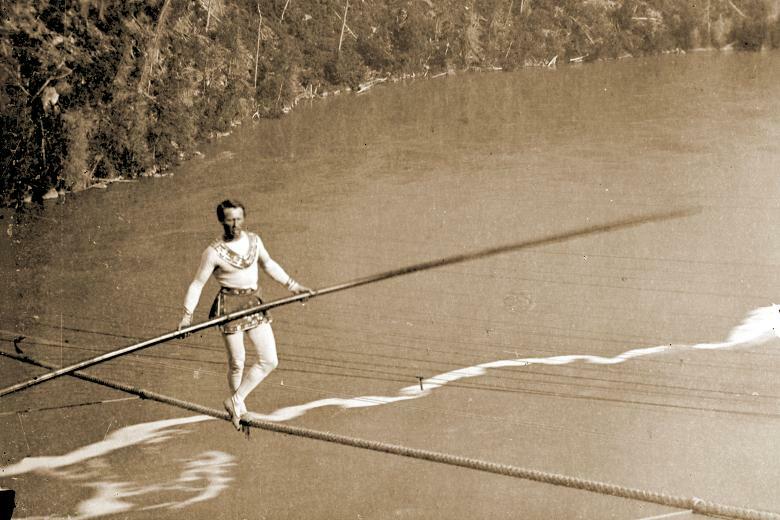 Blondin had recently made history as the first person to cross the falls on a tightrope, and on this day, he inched across again, hovering precariously above the swirling, violent waters below. As Blondin made his way safely across the gorge, the tense bewilderment of the crowd turned to a deafening roar of cheers. Then, Blondin spoke. “Do you believe I can cross the falls again?” he asked. Then Blondin asked, “Who will volunteer?” The crowd was silent. “Hardly! I can’t risk my life like that!” the man replied. Then, Blondin turned to his manager, Harry Colcord. “Harry, do you believe I can carry you across?” he asked. “Yes, Charles, I know you can,” Harry replied. “Then will you trust me to do it?” Charles asked. Harry Colcord stepped onto the platform with Blondin and hopped onto his back. Blondin, with his balancing pole in hand, slowly began to carry his friend across the Falls. Though a few of the guy ropes snapped as they crossed, they both made it safely to the other side, and Charles Blondin cemented his place as the greatest tightrope walker in history. Are you unsure if you are a Christian? Maybe you are like many in the crowd that day: you believe in Jesus with your mind, but you know that if He pointed at you to ask if you’d trust him to carry you, you’d recoil and say “Hardly! I can’t risk my life like that!” Maybe it’s time for you to trust Him and climb on. On Friday and Saturday, we have about 15 ladies who will be attending a Hispanic ladies retreat. I encourage you to pray for this retreat. Pray that God would use the speaker to speak to our ladies and pray that their faith may be strengthened. Salomon Lopez has invited all the men from Eastridge for a time of fellowship at his home 567 N. Bristol Ct., Wichita, KS 67206 at 6PM on Friday August 11th. It is important that men encourage one another and pray for one another to be the godly men God has called us to be. Proverbs 27:17 Iron sharpens iron, So one man sharpens another. On Saturday August 12th the trustees will have a work day at the church where everyone our church family is invited to come and help. We will be starting work at 8:30 am and we will end when the work is complete. We will be painting, fixing fixtures, killing and trimming weeds, replacing doors, general cleaning and many other task. Come out and help for as long as you are able while you enjoy your time working with fellow brothers and sisters. Last week we collected a special offering for all of our MNU (MidAmerica Nazarene University) students. This offering was used as a church matching scholarship from the University. MNU will match up to $500 for each student. If you were not able to contribute I have good news…it is not too late! You can still give towards our two students scholarship offering. If you would like to mark your gift to go directly one student you are certainly able to do that as well. MNU was founded like the other Nazarene regional colleges and universities to be a place where students could go for training as pastors and missionaries. The schools also provide education for other professions like teaching and nursing.